Despite the Soviet Union's suppression of a great many writers and filmmakers, the communist state nonetheless produced some of the finest film and literature of the 20th century. We are lucky, for example, to have Mikhail Bulgakov’s The Master and Margarita, which was never published during the author's lifetime and was for many years thereafter censored or relegated to samizdat versions. 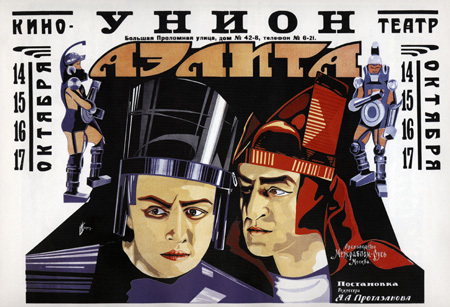 A similar fate almost befell the first Russian science fiction film, Aelita: Queen of Mars, a silent from 1924 that inspired such indispensable classics as Flash Gordon and Fritz Lang's Metropolis. The film—which tops a Guardian list of "Seven Soviet sci-fi films everyone should see"—contributed to a rich cinematic vocabulary without which it would be hard to imagine the aesthetics of much science fiction in general. Directed by Yakov Protazanov in the theatrical, futuristic constructivist style that Fritz Lang borrowed, Aelita tells the story of Los, an Earth engineer who builds a spaceship and travels to Mars to meet and fall in love with its queen. Further plot developments make clear that Lang may owe something to the film's story as well, involving a tyrannical Martian ruler, Aelita's father, who ruthlessly exploits his planet's proletariat. Allmovie describes Aelita as "the Marxist struggle reaches outer space" and indeed the film dramatizes an alien revolution very close to the one that took place back on Earth. Aelita the film made a favorable impression on its first audiences (see an original poster above). One of the first full-length films about space travel, it enabled ordinary Russians to imagine what may have seemed to them like the near future of Soviet technology. And yet, writes Andrew Horton in a lengthy essay on Aelita, despite its reputation, the sci-fi classic is "neither science fiction nor a pro-revolutionary film." Contemporary critics and filmmakers felt that Protazanov's adaptation not only showed insufficient commitment to the revolution, but it also manifested "alleged continuity with the bourgeois cinema of the Tsarist age"—a serious charge in the age of socialist realism and disruptive cinematic experiments like those of Dziga Vertov. In hindsight, however, Aelita turns out to have been a film before its time, and indeed a work of classic sci-fi, in its extremely imaginative use of technology, costuming, and set design. Without the fascination it has always held for film buffs, it might have disappeared, given its opposition to Party dogma: "The film praises domesticity and married life at a time when society was experimenting with the nature and meaning of relationships," Horton writes, "It is a film that looks to rebuilding, consolidation, progress and the future and rejects revolution as an unachievable Utopian ideal open to hijack." All of this context can seem a bit heavy, but we needn't work too hard to untangle Aelita's ideological strands. Simply enjoy the movie as an entertaining technical achievement from which we can draw a line to later sci-fi films like 1957's Road to the Stars (above) and, from there, to modern masterpieces like Stanley Kubrick's 2001. Aelita will be added to our list of 101 Silent Films, a subset of our larger collection, 1,150 Free Movies Online: Great Classics, Indies, Noir, Westerns, etc..
En realidad solo es algo muy soviético, muy a tono con la propaganda comunista que prácticamente anula al arte. La comparación se da con las películas propagandísticas norteamericanas de la 2 guerra. Mucha propaganda, mucha política, poco arte. En Aelita pasa eso: poco arte, y no veo influencia en la estética de la CF en general.